A few weeks we received a message from Joa Escribano, asking about the Ibiza Loves Ears campaign. A few days later he proposed a meeting at the Loca FM Ibiza studio. On the day we found a full team waiting to hear more. After our talk and giving earing protection information, director Luis Donoso proposed a collaboration. A weekly 2hr show on Saturday afternoon from 14h -16h. Uhm what? We were flabbergasted! Yes, of course we want to do this. No radio experience what so ever, but this opportunity doesn’t come twice! Today March 13th marks a big milestone for ILE. “I still need to let the idea sink in, but we confirmed a partnership with Loca FM Ibiza. Every Saturday from May 28th to sept 26th there will be a conscious Ibiza Loves Ears radio show! Broadcasted on Ibiza’s 107.6 FM and via Facebook LIVE-stream.” – Joost Toast. The concept is to raise awareness about hearing damage and tinnitus caused by music…and where we promote hearing protection all to save our fellow music lovers their ears! The first hour will be mixed and hosted by Joost Toast. In the second hour we invite a weekly Movement Ambassador guest mixer. By sharing content in combination with a live interview, we collectively thrive to inform the fanbase about the risks of loud music. 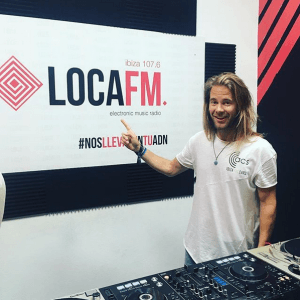 A big thanks to the Loca FM team! & stay tuned to hear more soon!